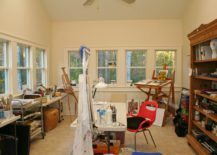 Being an artist and creating within the comfort of your own home can sometimes bring up a dilemma of where to put your home art studio and how to decorate it. 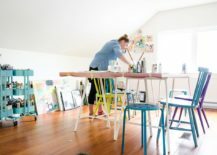 Surely you need one, because your canvases and easels can’t just take up space in your living room, but how to make the best of the limited space? 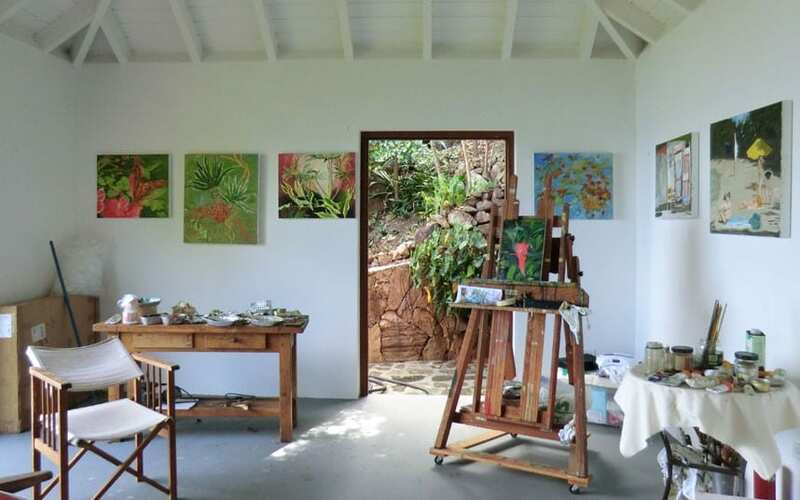 Your very own art studio is a sacred sanctuary, a creative space where all your artistic ideas come to life. 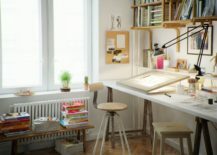 Whether you want to set it up in a smaller room or a bigger space, find the inspiration with these incredible home art studios! 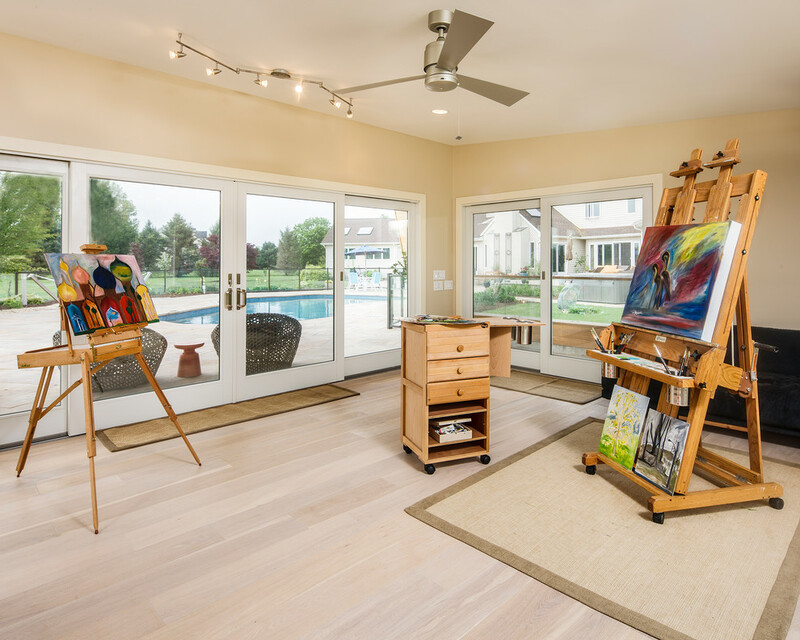 Your art studio is both a place to create and display your art in. 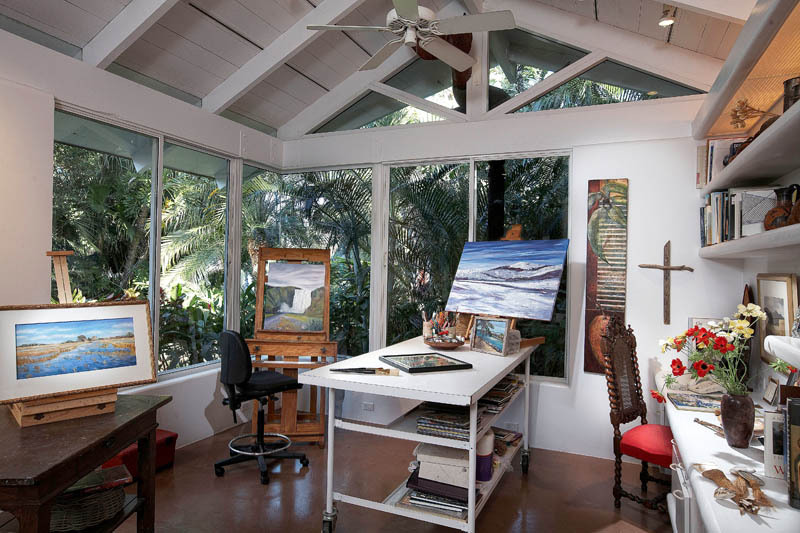 A bright studio with a lot of natural daylight is the perfect place for displaying your paintings on the white walls. It will mimic the feeling of being in an actual gallery, which will only inspire you to create more stunning art! 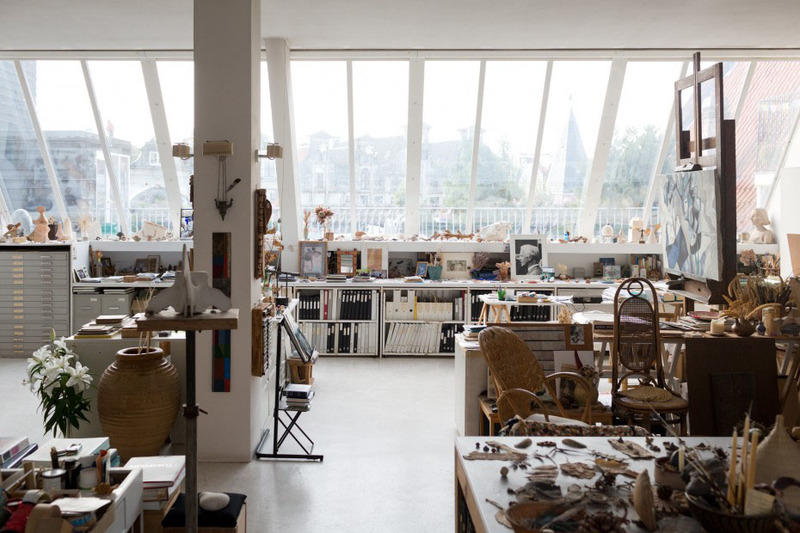 A mix of natural and artificial lighting is a good combination for any workspace. 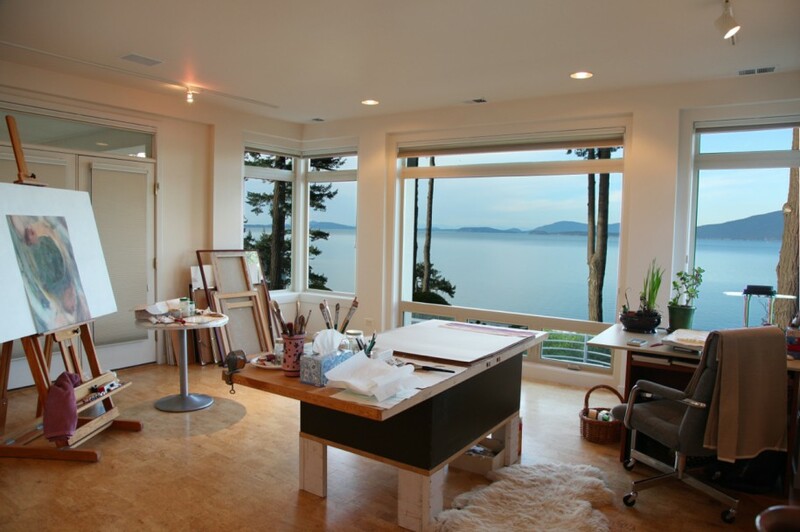 Place your desk next to a tall window and enjoy in the brightness of your creative room. 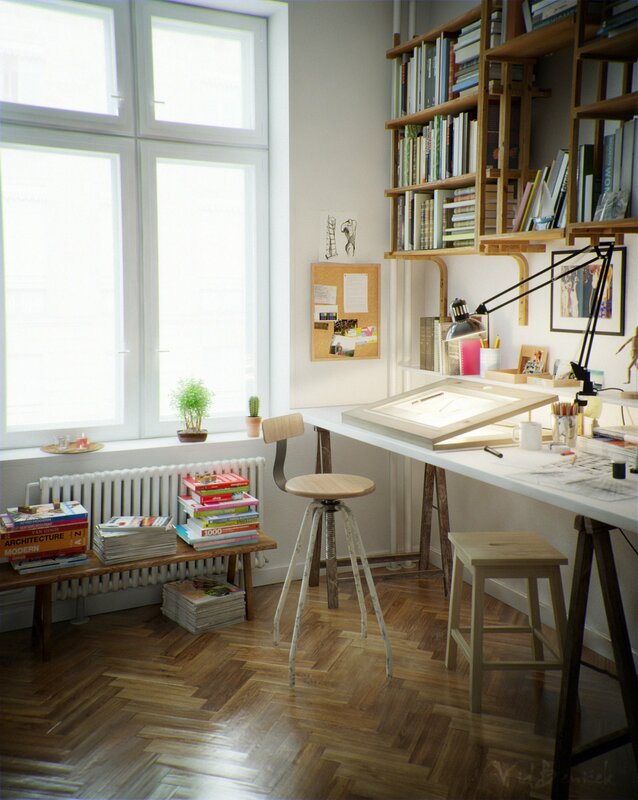 A spacious and bright creative corner is ideal for those who get inspired by the sunlight! 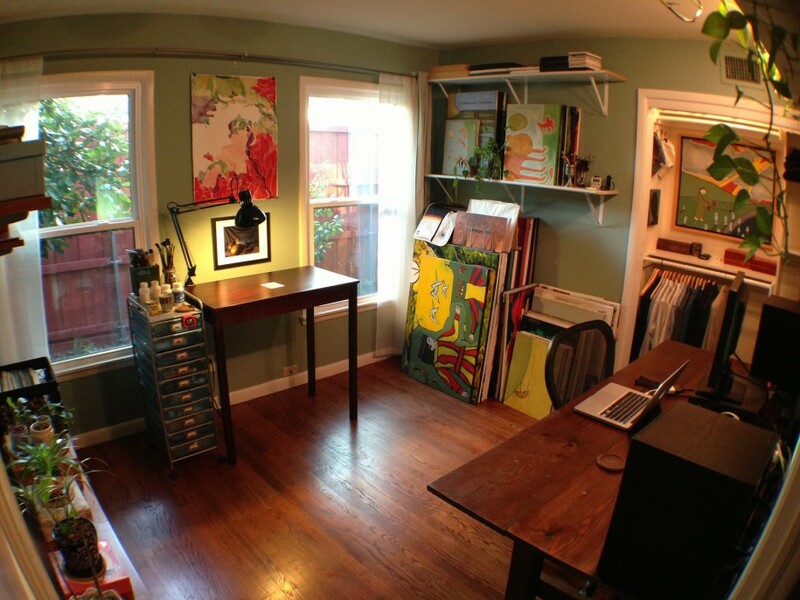 If you like to spend time in your studio during the day, you want it to feel luminous! 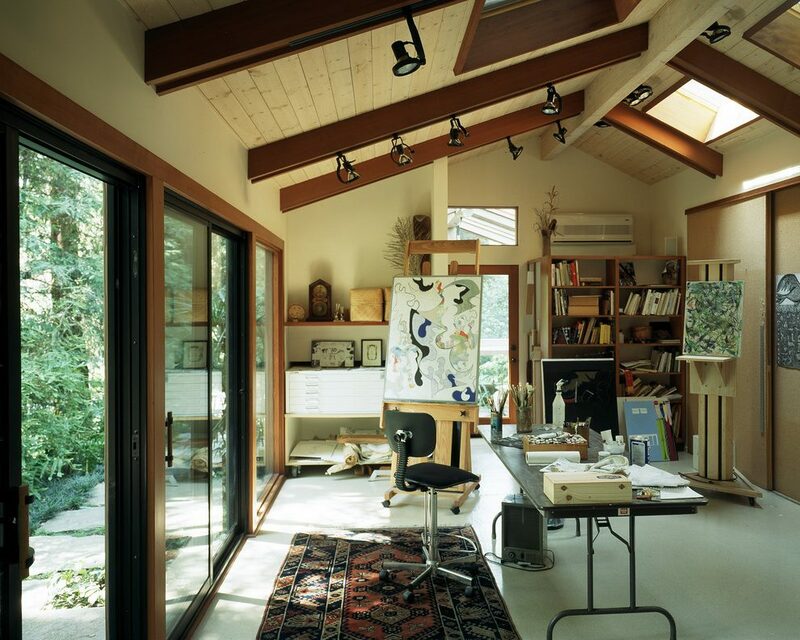 This has to be the dream home studio! 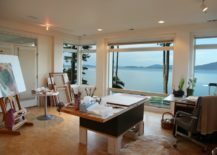 If you’re lucky enough to live in a place with an outstanding view, set up your art studio in a room with big windows that overlook the peaceful scenery and make you forget the glass is even there. 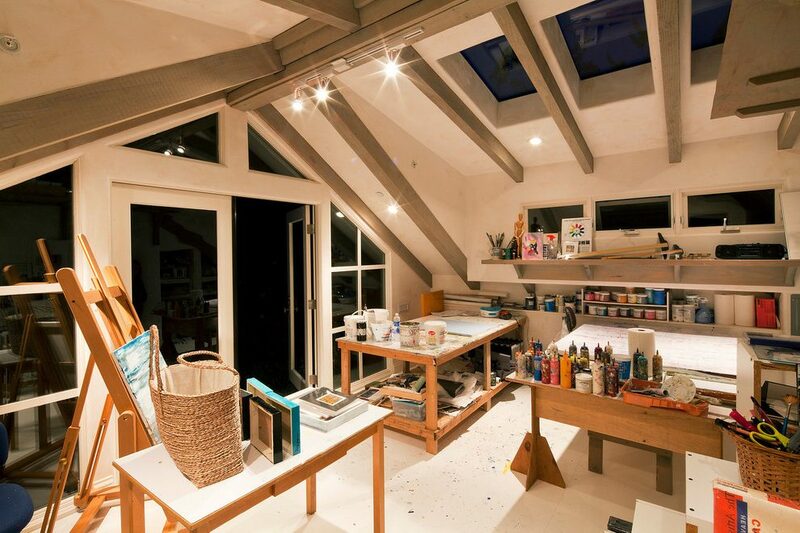 Seeing a studio that’s really full of art supplies but still feels so very breathable is really refreshing! 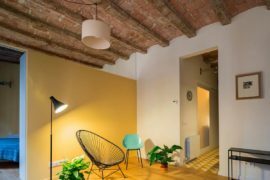 It shows that planning your interior with precision pays off in the long run. Place your desk in the center of the room to make it more accessible and remember that windows are your friends! 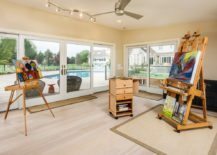 Start by dividing your big art studio with rustic barn doors that will be a very chic addition to the all-white interior, then set up a raised gallery above the doors and hang your colorful art on the white backdrop! 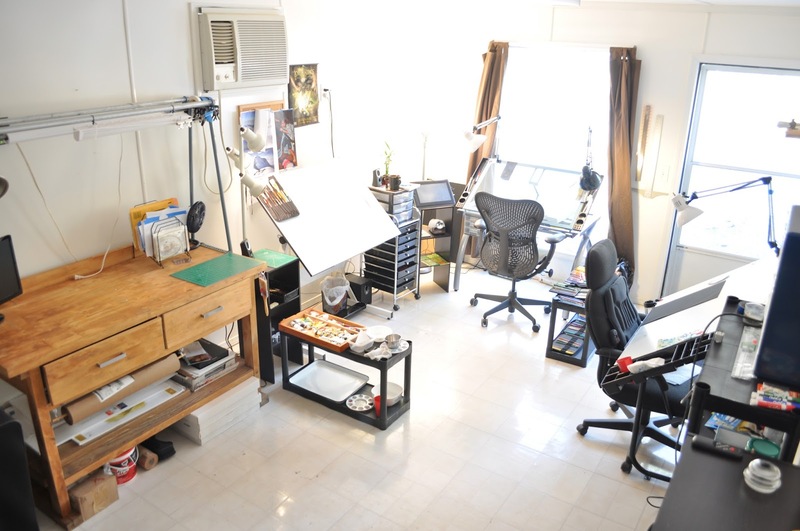 Maybe your line of creative work requires you to have several work stations or share your studio with a team. The desks can go against the walls to create an open space in the center where everyone can move freely and create their best work yet! 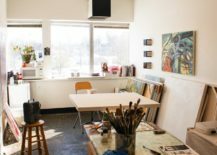 An open and rough art studio that sticks to the basics and shows off bare walls is a space where you can let your ideas run wild and be inspired by the cold atmosphere of the place. 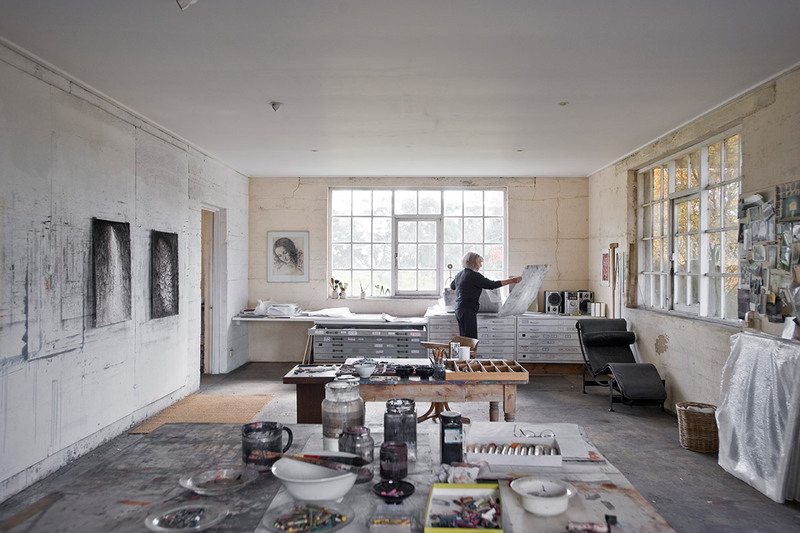 Vast and spacious art studios offer a lot of possibilities for both storage space and workspace. 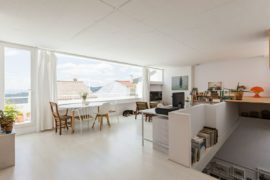 To avoid closing up the room, especially if you have a loft studio where the ceilings are lower, keep the walls white and add in big skylight windows. Minimalism is a concept that can be brought into any space, even the creative room. 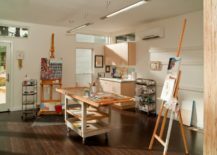 Pare your art supplies down to just essentials and leave the rest of the room clean, open and simplistic. 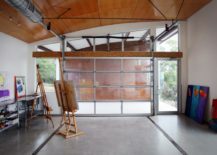 Finding the space within your home to set up a proper art studio can be a challenge, but a good place to start is a garage. 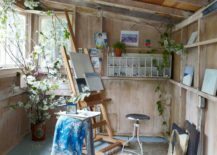 What once was a dark and dusty garage can in the next second become a tidy, bright and beautiful home art studio! 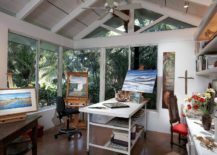 The classic studio often means a big space full of room to move around and store your bigger art pieces in, but a smaller studio can also have its charm! It’s incredibly cozy, like any other part of your home that you get to enjoy in. 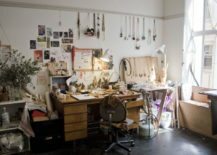 It’s a complete opposite of a home office; it doesn’t have to be neat to feel inspiring, it can actually get away with quite a bit of messiness! 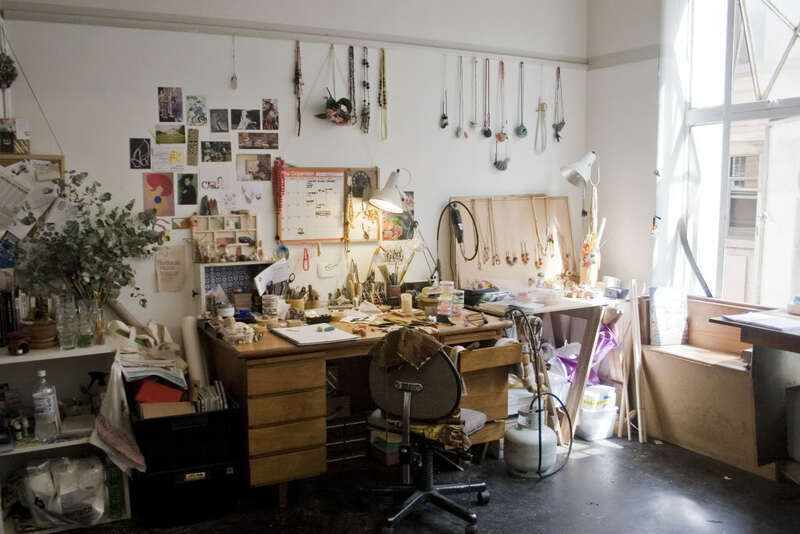 Living in a studio apartment usually means you are short on space, but there is always a way to set up a creative corner. A tilted desk is a fantastic option that won’t clutter your small room! 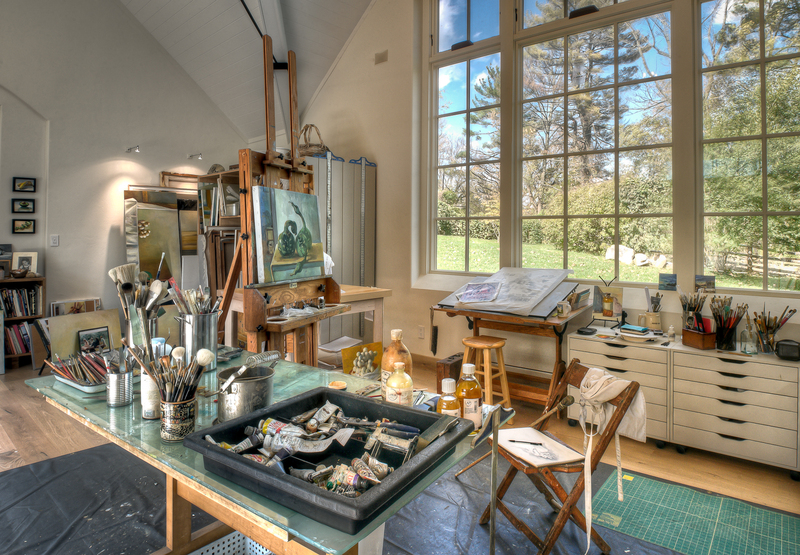 A vintage art studio is the perfect place to create in, because the space alone will feel incredibly inspiring. Light up the space with a classy chandelier and decorate the interior with shabby chic furniture! We can’t imagine a functional art studio in a small space without windows! They truly transform the room and the more full-size windows you add, the better! 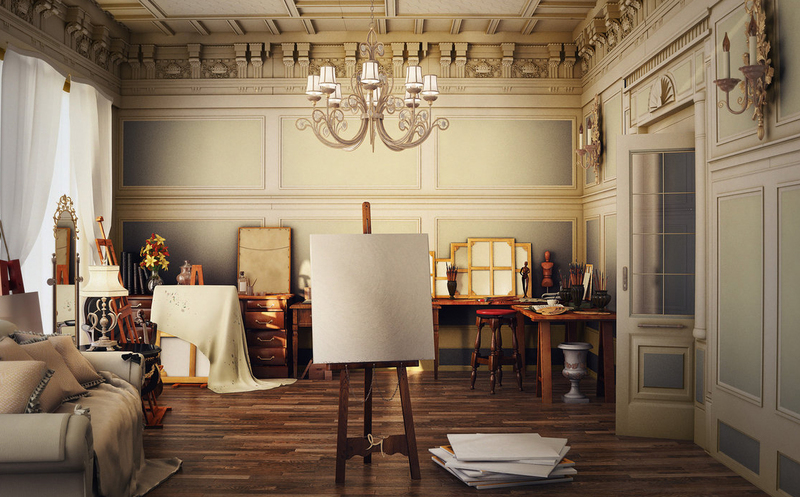 If your creativity blossoms in darker spaces, decorate your studio with olive green walls and dark wooden furniture. Place the desks at the opposite walls to maximize the space in a shared room. 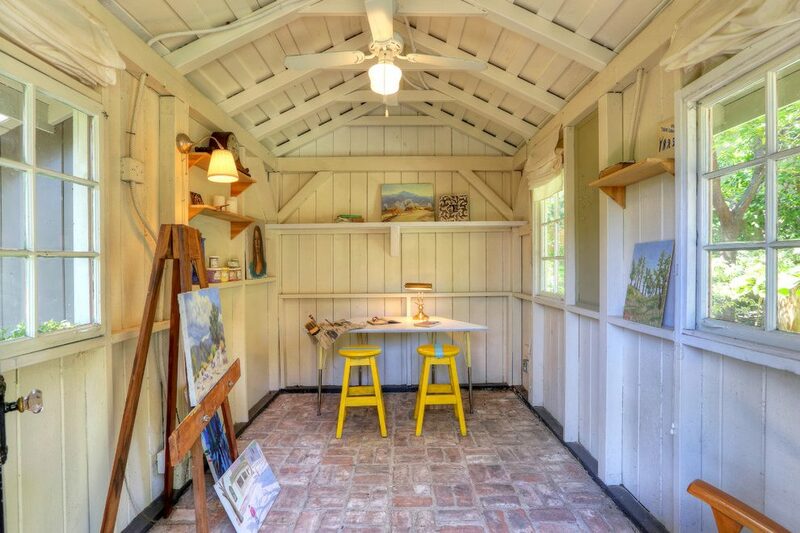 The charm of this creative corner lies in its tiny size. 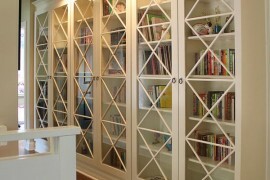 It has a profoundly secure feeling, like your very own artistic cave where coziness is the priority! The space doesn’t have to be huge in order to serve as an art studio. 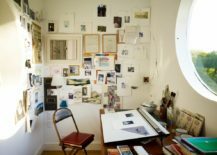 Even if your creative corner is literally just a small corner, you can make the best of it with a big round window and a wall full of inspiration! 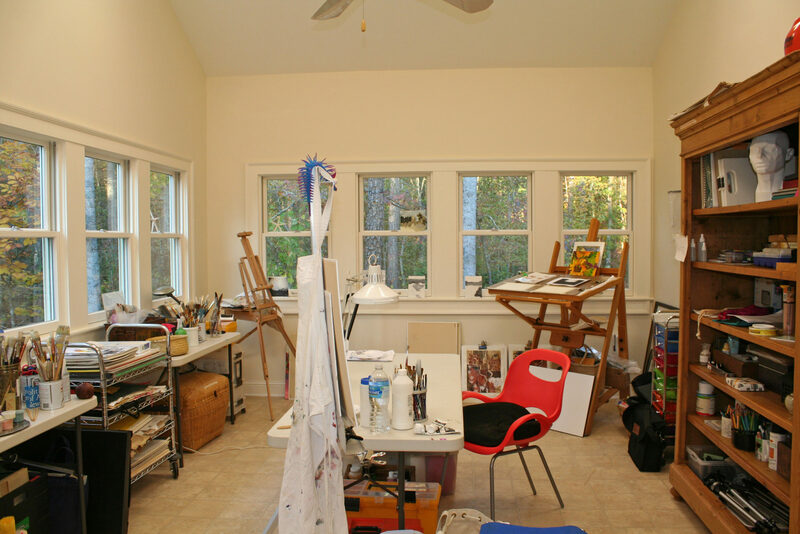 A white art studio is like a blank canvas – just waiting to be decorated with your art! Put up your best work on the walls but still leave a bit of blank space to give the room an illusion of spaciousness. 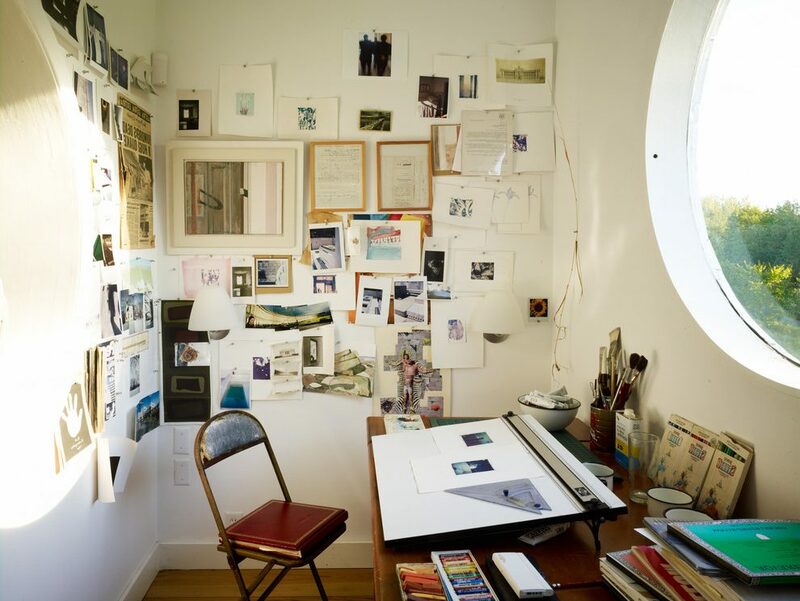 A simplistically decorated wall inside your art studio will be a neat and orderly element serving as a much-needed contrast to the messy interior creative spaces are usually known for! 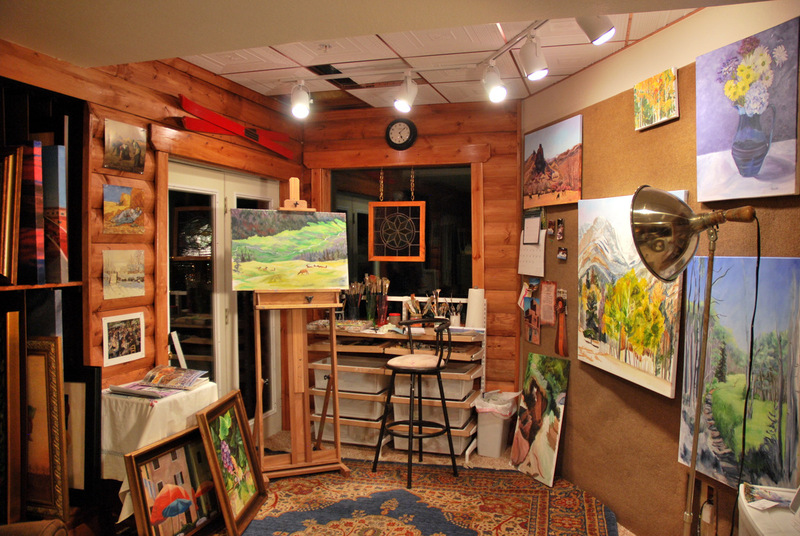 First and foremost, your art studio should be a reflection of you as an artist. 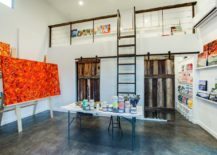 If your artistic expression is very bohemian and you don’t shy away from finding inspiration in a lot of physical items, this art studio will be a great source of inspiration. 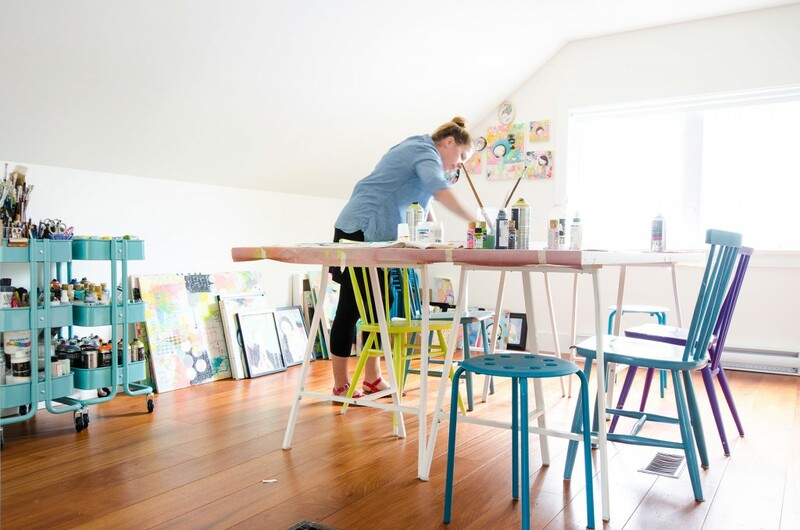 Artists are normally drawn to colors, so why not honor that within your creative space and (instead of painting the walls and affecting the brightness of the room) bring in some adorable chairs that represent a selection of your favorite colors! Your personal studio doesn’t have to feel like a classic studio. You can set it up like a workshop, with different stations and desks that are very close to each other. Everything is at hand and if you ever have more people included in your creative process, they’ll already have a designated space to work at! 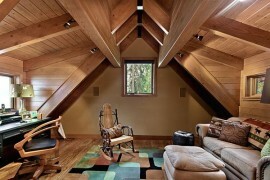 In order to make your home studio even more domestic and comfortable, wooden interior is a great choice. Whether you opt for raw, natural wood or a very processed and polished one, your studio will have that delicious rustic touch that can stand on its own or pair with modern elements! If you are inspired by traditional settings, opt for a simplistic art studio with a big rustic shelf case that channels the ambiance of a vintage atelier. 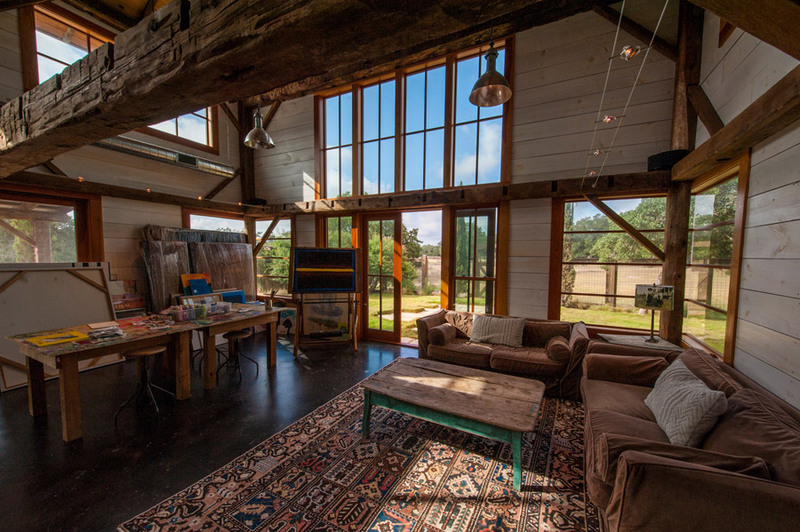 This rustic art studio has a strong farmhouse ambiance. 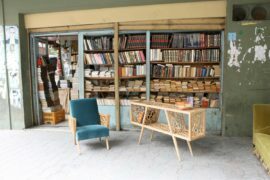 We love the wooden interior and its raw beauty! Set up a lounge area to make the space feel more comfortable and convenient for long nights of creating! Combined with the romantic ceiling lights, the gentle shade of wood is a wonderful backdrop for the vibrant red doors and sofa! 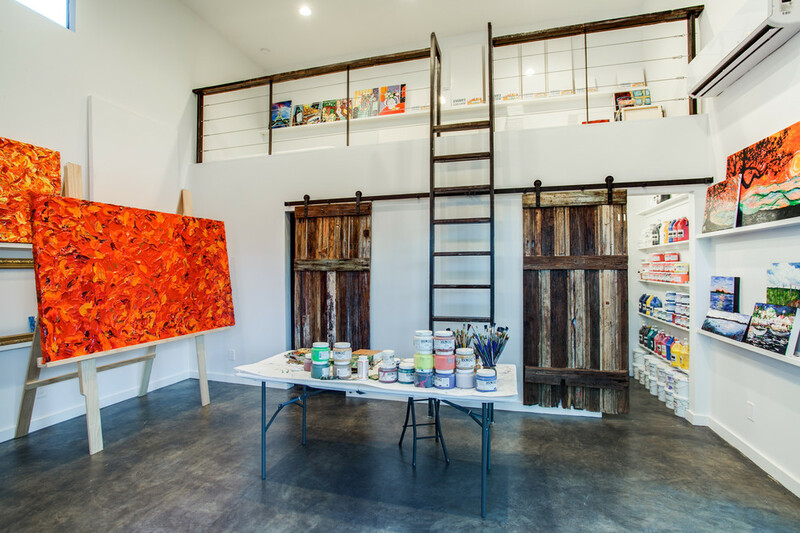 If you want your art studio to feel lively, shades of red will definitely bring it to life! 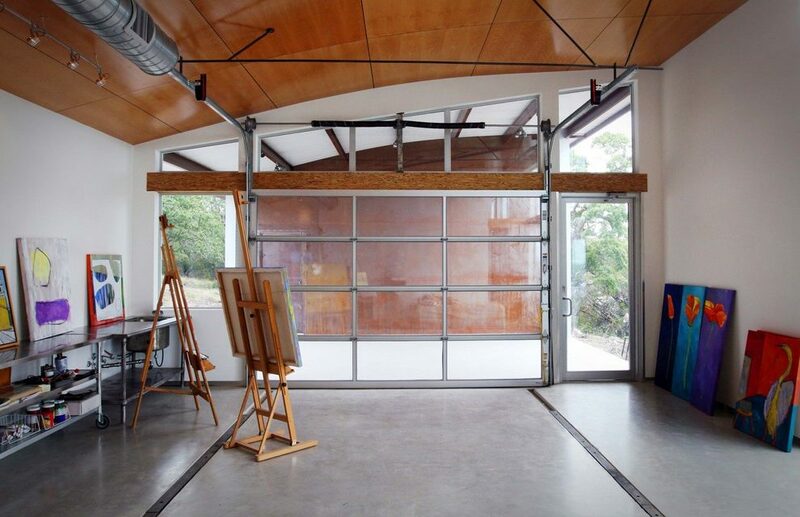 Seek your inspiration within a barn studio that’s seductively narrow and minimalistic! Only bring in the essentials you really need and don’t forget to add in some color, like the little two yellow stools! 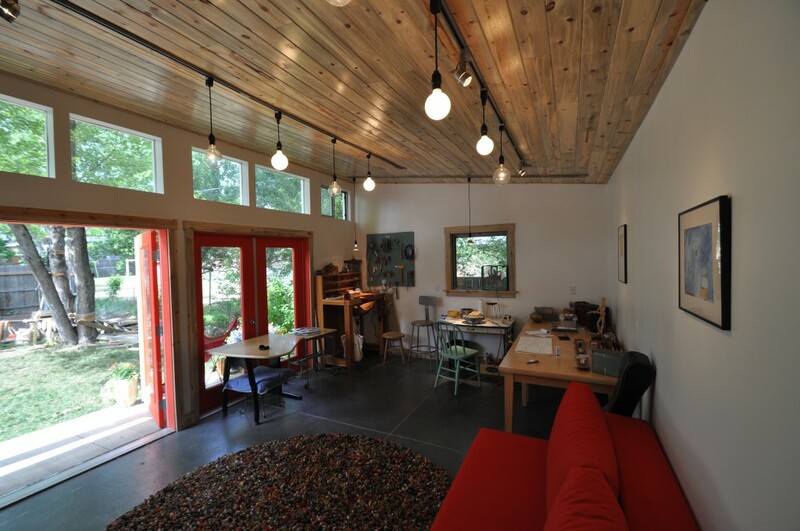 A beautiful art studio with a countryside interior is a peaceful place that feels like home. The big glass sliding doors provide the room with a lot of light and bring the nature’s beauty right inside. 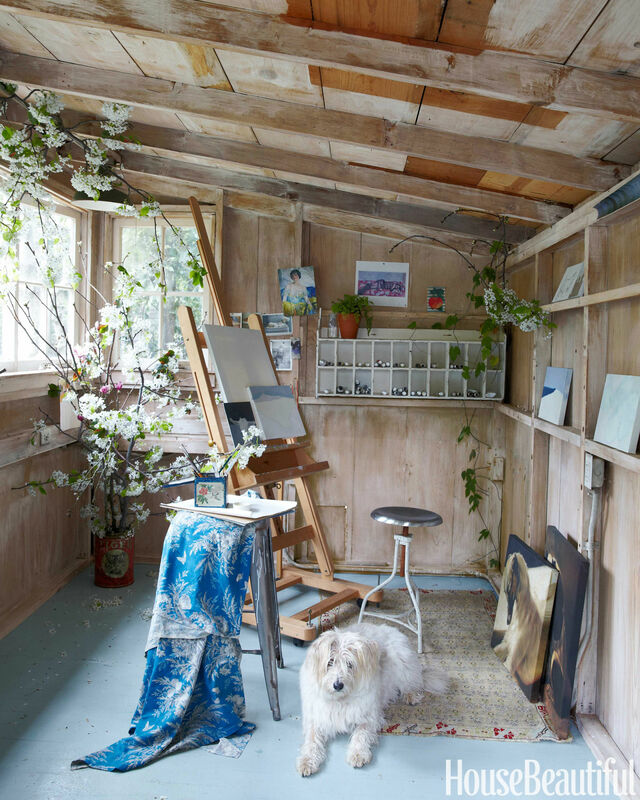 This art studio has a very traditional look, capturing the raw elegance of a wooden garden shed that serves as a sanctuary for the artist. We love the neutral color palette and the subtle inclusion of plants!